Parents, grandparents, aunts and uncles, there is nothing quite as special as a young life. So many adventures to go on, from visiting your favorite zoo and beaches, to your local walks, and playgrounds. Every adventure you have had becomes new again. We all love that precious baby skin, its so soft and beautiful, which is why we need to make sure that we protect it from the sun. Babies under 6 months old should not be exposed to direct sunlight, and babies between 6-12 months need to ensure that they are protected from the sun at all times when outdoors. If a baby under 12 months old gets sunburnt it is classified as a medical emergency. See the Skin Cancer Foundation’s information on how to treat babies if they do get sunburnt. Baby sun hats are not only cute, but they provide important protection to the baby’s face, neck and ears. Yes, the baby might yank the hat off their head faster than you put it on, but I’ll give you some options that will help. And while staying in the shade is a great idea, babies move, and they can be fast! The shade also moves depending on the time of day so why not give yourself an extra helping hand with a baby sun hat. Wide Brimmed – like the adult version but mini! These feature a wide brim all the way around to provide plenty of shade for your baby’s head. You may even be able to find matching adult ones for that extra cute factor! Bucket – these hats have a deep crown and a wide, downward slanted brim. They provide shade to the face, ears and neck. They also look super cute on babies. Legionnaire – These little guys have a baseball cap style crown and brim with a neck flap attached providing shade for most of your head. It’s important to make sure that the hat crown, or neck flap, fits over the baby’s ears to ensure they are also protected. Baseball – these do not provide enough protection for a baby’s face, ears and neck so there will not be any of these recommended. This is an important factor to consider when choosing a baby hat. You want to ensure that the fabric is cool, lightweight and comfortable because a hot baby means an irritable baby. You might not have heard of this one before. UPF stands for Ultraviolet Protection Factor. This rating system provides you with information on how much sun protection your clothing will provide you against those UV rays. Similar to SPF but for clothing. As we learned above wet clothing, including hats, could reduce the effectiveness of the sun protection in your clothing. If paddling around in the water is on your baby’s to do list this should be a consideration for you. Everyone wants their baby to look the cutest so there are lots of options with different colors and patterns so you are bound to find something you like. After careful research that combined discussing issues with customers, reviewing customer feedback, examining manufacturer specifications, participating in safe sun practices forums, SimplySunSafe has chosen the 5 best hats for sun protection for children. 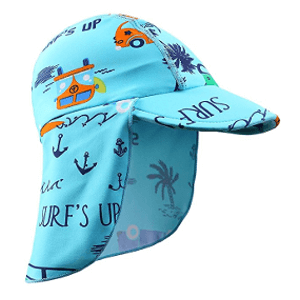 These sun hats provide a great UPF rating, are reasonably priced, different styles and fabrics, and some are also quick drying if your little one plans on getting wet. This is the champion. The winner. Well done to Coolibar again for providing great sun protection products for all ages. The classic bucket style hat with a twist. 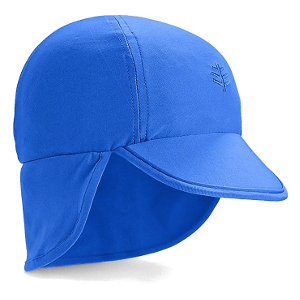 Depending on what coverage you need the front brim is able to be clipped up or down which may be helpful for those with children who don’t like the brim over their face or are just getting used to wearing hats for the first time. Made out of Polyester and Spandex it’s a comfortable snug fit on your bub’s head and also has a easy to use velcro chin strap to keep in securely in place. 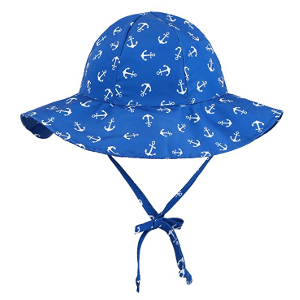 The baby bucket hat is also superior chlorine and saltwater resistant as well as being rated UPF 50. 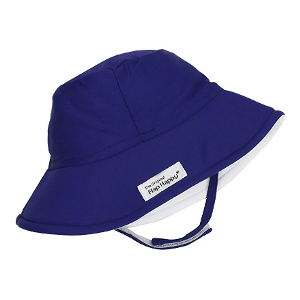 Get Coolibar Bucket Sun Hat Now! I can’t get over how cute this is! Another wide brim classic hat to protect your baby’s face, ears and neck but this is a swim hat as well. Rated UPF 50 for great sun protection this guy will quick dry as well. This hat also has an easy to use velcro chin strap to keep the hat firmly attached and in place. No hat throwing tantrums over here! For sizing there are 3 sizes available for babies depending on their age so make sure you pick the one that fits, if in doubt it’s better to go up a size as they will grow into it. Now, for colors, there are 12 bold, bright and happy colors and prints available. I am just not sure how you can even begin to choose! A perfect addition to your mini-me’s wardrobe. This hat was a very close second, it was only that it would only fit your bubbas for a short time that it didn’t win. Get Flap Happy Fun in the Sun Hat Now! Look at this little one. How are humans even that small?! This hat is more like a swimming cap with a neck flap at the back. It’s made from polyester and spandex which makes it super flexible for a great fit, and also great to pack and travel. The same as its champion big brother, the Baby Splashy hat is also superior chlorine and saltwater resistant as well as being rated UPF 50. To help keep your cheeky one’s head cool there is an internal sweatband. For sizing it is available in one size for babies 6-12 months. 8 different color combinations to match everyone’s style. Customer reviews note that they wish it had a chin strap for added security and that it’s great for lazy pool days. Get Coolibar Baby Splashy Hat Now! This one looks a little different. The baseball style with a long neck flap is great for providing lots of shade for the neck and ears. It’s made out of swimwear fabric so it will be super comfortable, and quick drying for your swimming adventures. Rates UPF 50 for maximum protection and is super easy to fold and pack for outings to the beach. For sizing it’s only available for 6-18 month olds, so make sure you check your baby’s head circumference to ensure this will fit. There is 3 stylish patterns available for both the boys and the girls. Get Huanqiue Baby Sun Hat Now! This wide floppy brim style will provide shade for your baby’s face, head, ears and neck. It is rated at UPF 50+ so you know you’ve got your little one the best protection out there. To keep this hat securely on their head this hat features an adjustable tieable drawstring, which could be a challenge doing up if you have a particularly squirmy baby on your hands. Size small is for babies 0-12 months so it will keep them covered for a full year. It’s super easy to fold and travel with for those of you taking babies on holidays. So how about colors? Well there are 18 color and pattern options so you will definitely find something that suits your taste. This hat is also made out of polyester which is nice a breathable for your baby’s head. A great reasonable priced option to protect your baby in the warmer months. 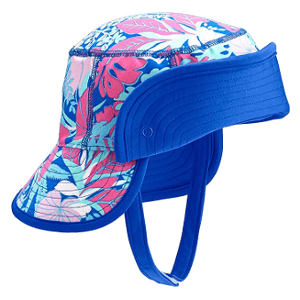 Get SimpliKids Wide Brim Sun Hat Now! So this article was for everyone with a special baby in their life that they want to keep protected from the sun. It is such an important job raising little ones and you really do need to think of everything. 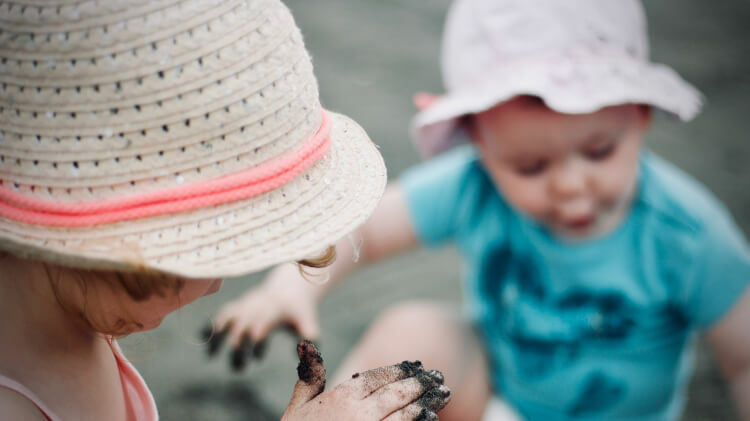 Hopefully this article assisted you in not only figuring out which purchase to make but also deciding on which features are important to you and your family when purchasing a baby sun hat. Baby skin is too precious to get damaged and a sunburnt baby is an unhappy bubba. If you are after some activities to undertake with you little family outside see the The Imagination Tree’s website for some great ideas. 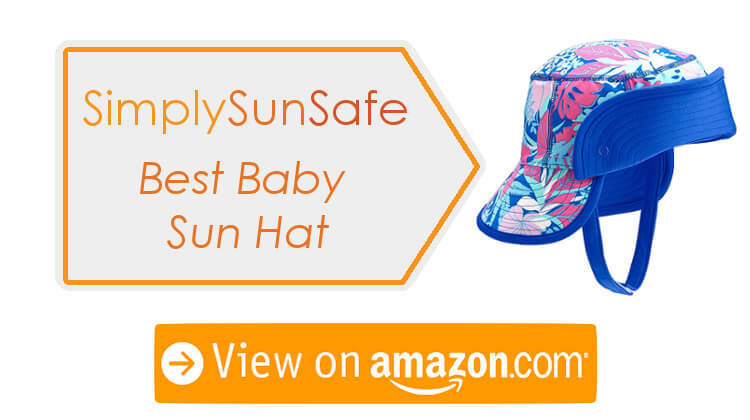 SimplySunSafe recommends the Coolibar Baby Sun Bucket Hat as the best baby sun hat. After thoroughly researching the best sun blocking hats for toddlers and babies this was my favorite. The features of this hat were outstanding and the price point meant that is really is the best pick. However, if you prefer one of the other styles pick them, or pick more than one! Babies can’t think for themselves so it is our job to make sure that we protect them from the sun. Always remember to not only put a hat on them, but regularly apply broad spectrum sunscreen, ensure they are covered as much as possible UPF rated clothing and get them to wear sunglasses if possible. Have a look at Johnson’s Baby website for some important information on how to keep your baby’s skin safe. I love hearing from you guys if this article encouraged you to make a purchase, or if you found another baby sun hat that didn’t make this list please let me know about it in the comments. I love updating my guides, checking out new products and undertaking research to ensure I have provided my loyal readers with the best information possible.